Canada yesterday formally recognized the refugee status of the 850,000 Jews who fled or were expelled from Arab countries after Israel’s founding. The recognition follows a November 2013 report to the Canadian House of Commons Standing Committee on Foreign Affairs on “Recognizing Jewish Refugees from the Middle East and North Africa.” The report detailed the persecutions faced by Jews living in Arab countries in the 20th century and the circumstance that led to almost all of them leaving their homes in such countries as Egypt, Iraq, Morocco, Algeria, Tunisia, Syria, Libya, Lebanon, and Yemen. Jews had inhabited those countries for centuries. After World War II and the establishment of the State of Israel, the World Jewish Congress was among the foremost organizations assisting Jews in Arab and other Muslim countries. In the 1950s, the WJC negotiated the safe passage of Jewish refugees with a number of Arab governments, especially in North Africa. 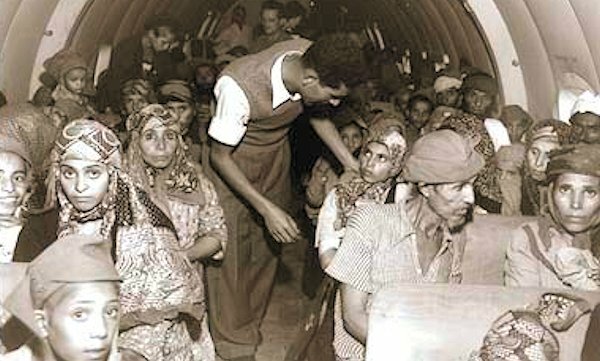 Yemenite refugees on a plane to Israel. The issue of the 850,000 Jewish refugees from Arab lands continues to be a WJC focus. WJC President Ronald S. Lauder submitted testimony to the Canadian Foreign Affairs Committee last year. WJC also sponsored a conference on the topic at the United Nations in November 2013. In response to Canada’s announcement, the chairman of the Center for Jewish and Israel Affairs, a Canadian WJC affiliate, David Koschitzky, said that the recognition “is an important step toward achieving a comprehensive, negotiated two-state peace with an absolute end to the conflict and all claims.” Koschitzky, a WJC vice president, will brief the organization on the development at the Executive Committee meeting in Paris next month.